Attending the National Colorectal Cancer Round Table (NCCRT) annual meeting in MD. Thanks to EnFocus Media for designing Be a Blue Buddy's logo! 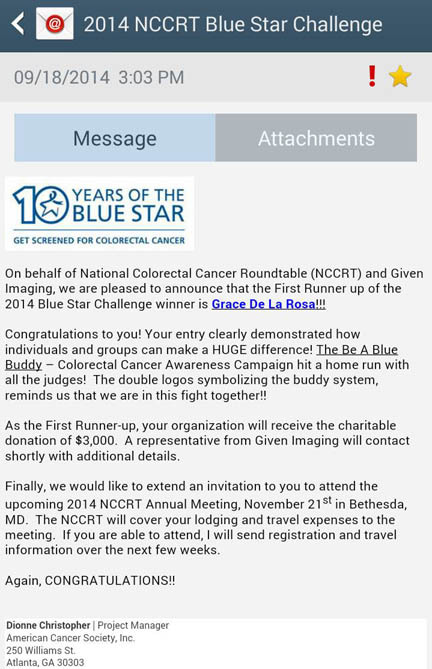 Together, we were awarded first runner-up in the 2014 NCCRT Blue Star Challenge. Charitable proceeds will go to Colon Cancer Alliance's (CCA) Blue Hope Prevention Award, funding for individuals and family members for colorectal cancer screening-related issues. Post by Grace De La Rosa. WEAR BLUE on the first Friday of every March (Fri., March 6, 2015). It's an easy and effective way for our community to unite, show support for survivors, give hope to newly diagnosed patients and honor those who have died from this disease. It's also a fantastic way to start a conversation about the importance of screening and perhaps save lives. Tell your family, friends and colleagues to join in. Send photos of you and your group dressed in blue. I'll post them on Be a Blue Buddy's Facebook page so others who are affected by colorectal cancer can see that they are not alone in this fight!